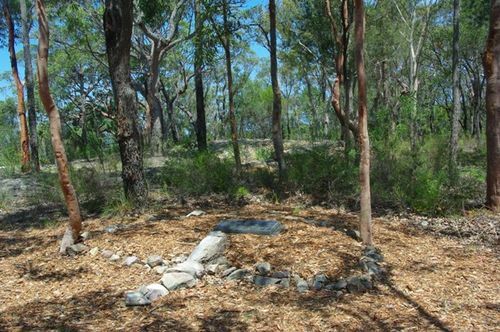 A memorial commemorates bushfire brigade members who gave their lives whilst fighting the fire which threatened Grays Point, and to brigade members who were injured in the fire. Tragedy was to strike on 9th January 1983 at Grays Point when a fire burning under record high temperatures (maximum. 43 C) was to trap the crew of Heathcote 81 with the death of three of the crew and serious burns to other crew members. Date - January 9, 1983: four bushfire brigades were dispatched to a fire trail on Anana Hill to fight fires heading towards houses and nearby Grays Point Public School. The crew included captain Keith Campbell, his daughter Sharon, Thomas Bielecke, Gregory Moon, Jim Fowler, Paul Fenn, Craig Goodall, Craig Blanche, Robert Sawyer, Phillip Bourke and Rod Crane. The mercury had risen to 38 degrees at Sydney Airport and late in the afternoon the crew were told to withdraw as winds picked up. The crew were retreating when they noticed a woman they thought was stranded near Angle Road. Keith Campbell sent three of his team to help the woman, not knowing she was a spectator and in no danger. One volunteer escorted the woman to safety and two members returned, but as the crew tried to get out, fire blocked their path. They frantically tried to backburn around the truck to give themselves shelter but the blaze was too fierce. They huddled next to the tanker as the fire roared through. Mr Campbell died metres from the truck trying shield his crew with a hose.